I have been a Globe for 13 years now (yucks, I'm old! haha) and although there are so many complaints about them left and right, I can't let them go. What I love about them the most, though, is the fact that they know how to grow and adapt to their users' needs. 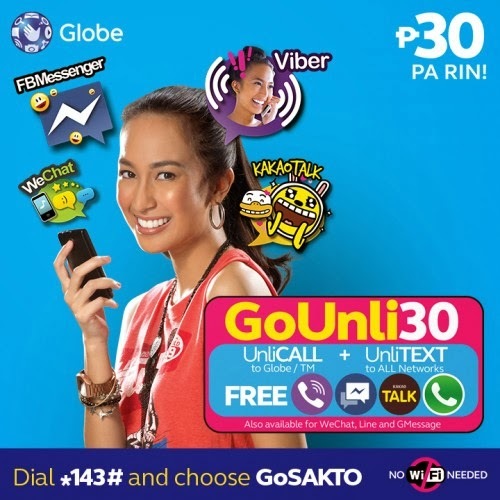 Recently, Globe has launched the GoUNLI30, which provides the REAL UNLI chat experience. Although it was enough to be able to text a person 13 years ago, social media networks and all sorts of awesome technology have come our way since then. 5 years ago, Facebook became an important part of everybody's life. A few years after that, Twitter became a thing. Now, there's Viber, WeChat, and Kakao to think about, too. I actually wake up every morning, telling myself to check every single one of these apps before getting out of bed and although it can be quite a hassle to do so; Globe has fortunately made the job easier for us with Globe GoUnli30.